Rihanna speaks during her Fenty Beauty talk in collaboration with Sephora, for the launch of her new Stunna Lip paint ‘Uninvited’ on September 29, 2018 in Dubai, United Arab Emirates. Rihanna is poppin’. 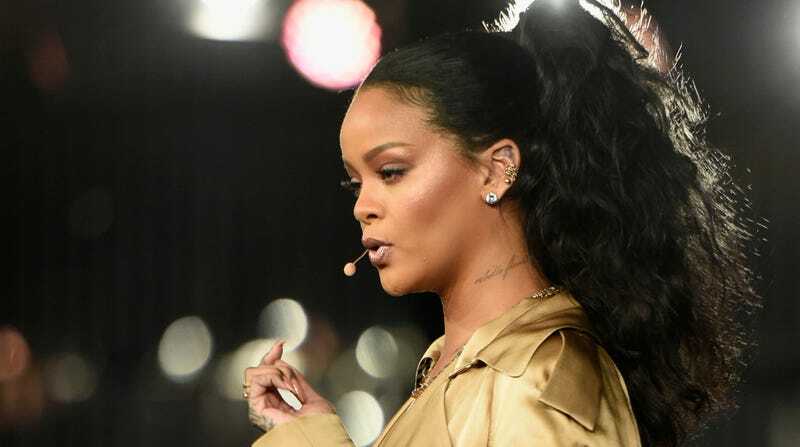 With Fenty Beauty and Savage x Fenty thriving, as well as the high anticipation for new music, everyone wants a piece of Ms. Robyn Fenty. However, one such person is allegedly doing so through illegal means. And it’s her own father. According to TMZ, Ronald Fenty apparently implemented a talent development company named Fenty Entertainment in 2017. However, Rih claims her dad is attempting to profit from her name. Additionally, the Anti singer previously trademarked her surname for business venture purposes. The claims include false advertising, false light publicity and false designation of origin, among others, requesting an injunction on the name as well as seeking damages. One specific claim involves allegedly using Rih’s name to book shows in Latin America on her behalf, yet without her expressed authorization. Rih’s legal team also claims Fenty and Perkins have ignored their cease and desist orders. We have reached out to Rihanna’s legal team for comment and will update as additional details arise.